**This post contains affiliate links. Meaning, when you click on a product link, I can make a small amount of money, either in the form of the click itself, or in commission if you purchase anything from the site. Oh winter, you think your clever with your crazy cold polar vortex days, snow storms and then 100 degree turnarounds where everything melts, and…well, is just kinda ugly outside? Well, jokes on you girl, because I know eventually you’ll come around. Things will be pretty again. Breaths will be easier to take. And heat bills won’t be so high. But until then…. We gotta know how to dress, am I right? Whether you’re wondering what to wear in 40 degree weather, 20 degree weather, or, yes, -50 degree weather (opt for a blanket in that case), dressing in winter can be tough. I mean, is it even possible to look cute, but still feel warm? If we’re going to be picky, there are some days, where yeah, it’s basically impossible to stay warm, but, most of the time yes - we can have our cute comfy outfits and our warm cozy feels too. 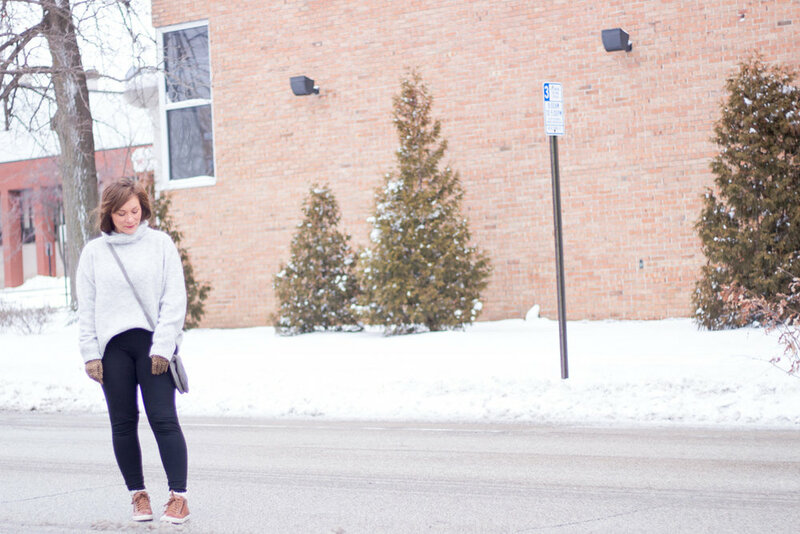 Layers are Key: if you live in the Midwest, you know alllll about layers. Not to brag, but, we get really good at layering because when it comes to weather, it’s not uncommon to experience multiple seasons in one day. Lucky us. Key Pieces: Cardigans and jackets, slouchy oversized sweaters (I’m wearing two shirts under this one), fitted tees or henleys plus tights, leggings and boots 1/2 size to full size too big so you can don multiple pair of socks. Learn to create a shape. Winter is SO easy to look a little bit like, well, a potato sack. All of those layers can make us look dimension-less and about 2 sizes larger than we actually are. That said, a tuck here or a knot there add dimension and make us feel and look like we actually have a shape. Cropped jackets, belts and cinched waists will also help to create dimension as well. Cold, icy weather doesn’t mean saying goodbye to cute shoes (and socks). Most of my winter boots are at least a half size too big, technically. But when I wear them with a pair of socks, or sometimes even two pair of socks, They’re a perfect fit. AND, my feet stay warm. Look for cute flat booties or sneakers as well so my fashion doesn’t have to be completely swept to the side because of the weather. Comfortable doesn’t have to be boring. Keep it chic with other elements, like leopard print accessories. I love donning something casual, but cute, on cold snowy days. Some days, I just don’t want to put a lot of thought into an outfit. Separates are perfect for said occasions! Layering is an art form in the winter season. Strategically wear items that allow for layers to stay warm. This comfy outfit is perfect for traveling. It’s easy to move in, allows for layers and looks great with your favorite flats for walking. From style lessons to life’s lessons, you’re getting a lil’ of everything in this post. Now that we know how to dress for this season, it’s time to talk about things a little more heavy, as in how to handle rejection. I know when we first hear those words, we think about the rejection of someone - a boyfriend or other loved one. But the truth is, rejection comes in all sorts of forms, as I was reminded of this week. You may or may not know, but one of my little side jobs is lifestyle photography. I’ve worked with lots of smaller brands who want their product photographed in a lifestyle setting instead of just the plain white or other solid colored background. This past week, I got a job photographing a food product and after talking about what the brand was looking for, I shot the photos, got them in a day before the deadline and LOVED them. Most people don’t realize that I shoot all my own pictures, yes, even the ones with me in them. I’m fairly honest with myself, and whether for my blog or a brand, I will be the first to admit if a photo is less than stellar. I sent them in and….crickets. Finally, on Friday night I got a message from them and they were less than pleased. “Disappointed,” with the work and “pointless” are the key adjectives that stuck out. I was SO upset. I’m not the kind of person that produces (at least intentionally) low quality work…in anything I do. So the words disappointed and pointless felt a little bit like a punch to the gut. I spent the better part of a day on the project, and included some time outside (yep, during the 50 below day) because they really really wanted at least one outdoor photo. I let myself be sad, but only for a little bit. After that, I make a conscious effort to move on. I get out, I talk to people and I live my life. I focus. Have you ever noticed that when you’re upset about something, the world revolves around that emotion. I know it’s hard, but I also know if I don’t focus on something else, I stay upset way longer than necessary. This weekend, as soon as I took my mind elsewhere, it was amazing how much smaller the feeling of rejection felt. I realize I can’t always make everyone happy….and that’s not my responsibility anyway. It’s crazy how we do that. We make ourselves feel like we’re the cause of someone’s happiness, or unhappiness. I mean, yeah, if I walk outside and punch someone in the face, I would probably be the cause of someone’s unhappiness. BUT, if I treat people good, with respect, if I work hard and in this case, do my best to complete a project, well, that’s all I can do. Take it or leave it. Soooo, if you’re dying to know how this story ends…Saturday morning I woke up and accepted the fact that this kind of thing was bound to happen. After all, this line of work is really subjective. I might look at a photograph and think it’s great, but, lots of other people might think it’s very ho-hum. I didn’t take it personal, sent him a message apologizing that this set of photographs wasn’t quite what he wanted and let him know he would have a new set by the end of the weekend. Sunday morning, I woke up nice and early, got everything set up as perfect as I could make it, and re-shot everything. They were edited and to the client that evening. The result…he still hated them, lol! At that point, I didn’t feel rejected. I just accepted the fact that I can’t please everyone. I was proud of my work and in this instance, that’s all that matters. Thanks for reading everyone - your support seriously means the absolute world to me! Let me know in the comments below how you deal with rejection and/or if you have a go-to winter outfit to keep cute in the cold! P.S. I’ve got a new Valentine’s Day post up on the shopping side of my site. Check it out here!